Keeping chickens in a tractor is great. The puppy can't molest them. The neighborhood coyotes can't get them. Even the local raccoons have left them alone so far. The downside is, every time I move the tractor, and that's at least twice a day, I have to crouch over, reach into the pen, pull out a HEAVY feeder and waterer, stand up, move the pen, and crouch back down and put the feeder and waterer back in. My back is strong, but it ain't made for too much of that!!! I really wanted a feeder that would mount inside of the tractor so that it would move with it. It also had to hold plenty of feed so I can save some effort in not refilling it daily. It had to have a lid to keep out rain. And it had to be easy to fill from the outside, so that my allergy-ridden husband can just pour a bucket of feed in the top and be out of the picture if I'm away or unable to do the feeding at some point. My solution was the Stove Pipe Feeder. It took 20 minutes to get it mounted and adjusted, and despite some haphazard building supplies, it stays on tight even bouncing over our uneven property. I'm pleased as punch about it, and a little punchy to boot! This design would work equally well on the wall inside or outside of a regular coop. 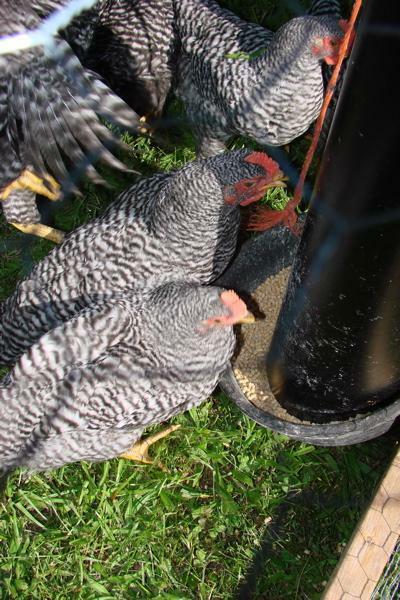 And for the really industrious, you could drill a few holes in the bottom of both the pipe and the feed pan and wire them together to create a hanging feeder on a budget. Beats paying $50 or so for a galvanized, hanging feeder! I have not filled this to the brim yet, but it will hold about 8 gallons of feed. One thing I forgot to do in my rush to build this last weekend was to drill drainage holes in the bottom of the pan first thing. It filled up with water the next day! 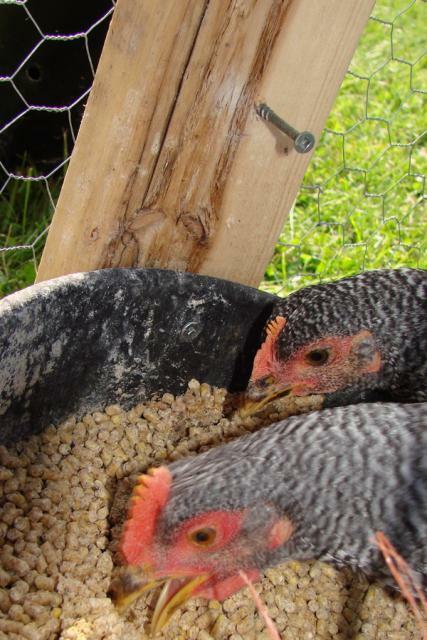 But the chicks loved the mushy feed, so you can decide how you want to handle that. The other option would be to buy a piece of heating vent in the big, rectangular shape. Put that over the stove pipe to serve as a hood. 3' Stove Pipe. Available at Home Depot or any home store. 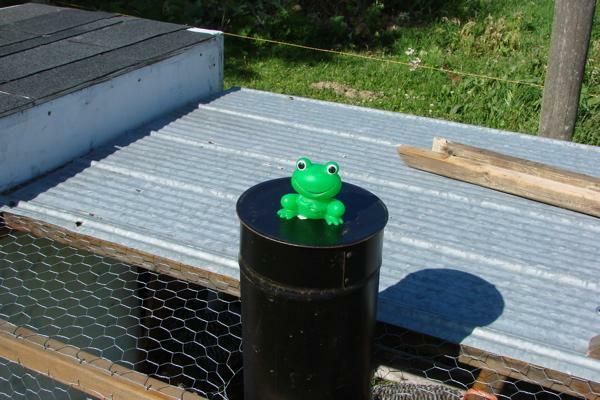 Pipe Cap-This fits snugly and very securely on the top to keep out rain. Feed Pan- At least 5" wider than your pipe. Available at a livestock store, paid about $4. Find it in the livestock section. The heavy-duty, flexible rubber is used for feeding calves, pigs, and horses. They last forever and are very forgiving. 1. With the 1/2" drill bit, drill two holes in the side of the feed pan, one above the other, about 2" apart. Drill a third hole under the lip of the pan on the opposite side as the first holes. 2. Change the bit on the drill and mount the feed pan to the side of your tractor, at least an inch above the ground to prevent dragging. Drive one screw through the top hole first, into the frame of your tractor. Once you're satisfied that it's high enough off the ground, drill the second screw through the lower hole in the pan. Once done, you should be able to lift the pan up, off the screws to remove for cleaning. 3. Thread your twine or chain through the hole under the lip of the pan and tie or attach it to the top of the tractor so that the front of the pan is level with the back. 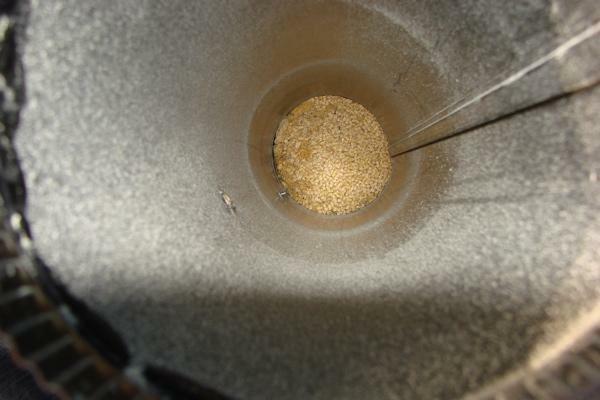 Otherwise, once you fill it with grain it will sag sadly to the ground and defeat the purpose of controlling how the grain flows out of the pipe. 4. Mount two screws above the feed pan. These will be the brackets for the stove pipe. Place the first one a few inches above the feed pan. Place the second one a few inches from the top of the tractor. Do NOT drill all the way into the wood. Keep them sticking out at least an inch. 5. My tractor easily accommodated the pipe by clipping a hole in the chicken wire at the top of the tractor. Your design might require a different approach. 6. Position the stove pipe over the feed pan, about an inch off the bottom, and BANG it against the two screws. You need to make a little dent so you know where to drill holes in the pipe. 7. Put the pipe on the ground. 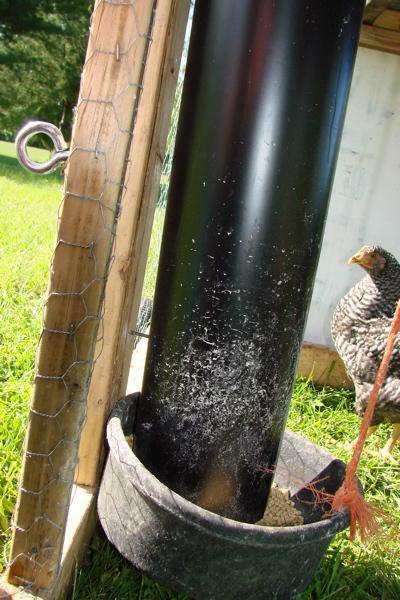 Put the 1/2" drill bit on your drill and bore two 1/2" holes into the stove pipe where the dents are. 8. 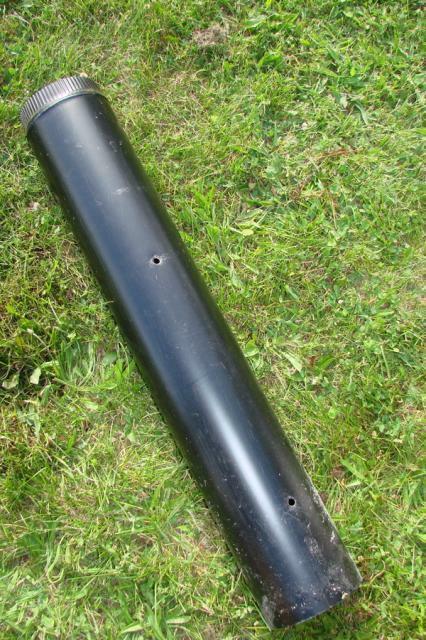 Slide the pipe into the tractor and slip the two holes in the pipe over the screws in the tractor frame. 9. Give it a good rattle to see if everything holds, and reposition the pipe screws if necessary to get more tension. I wound up pulling the screws out a little further than an inch to get a better grip for my tractor. 10. 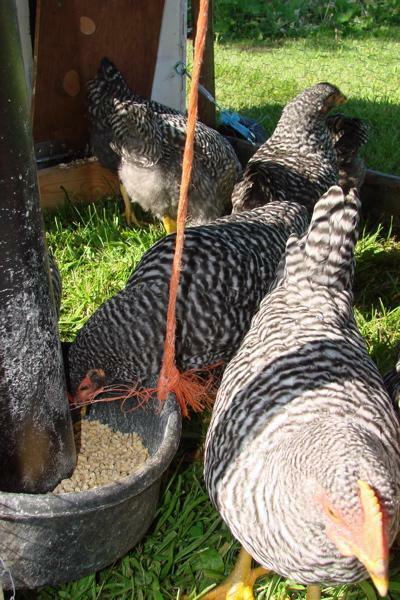 Pour in a tester bucket of feed, make sure it's coming out into the feed pan nicely, and put the cap on the pipe. Clear pics, good description & a parts list! Looks like a decent solution to including a feeder into the tractor. Great idea, I was going to go with the PVC method put I like the fact that this is bigger. And instead of a feed pan you could just cut down a 5 gallon bucket so its only 2 or 3 inches tall. And you also did not meant the frog in the material list. where do you get one of those at and how much do they cost? You can add a rain cap to it instead of the rubber pan and all will be one piece after screwed together.